Work by Kevin Busta of Kevin Busta Industrial Furnishings 2673 West 14th Street. Adult arts education classes begin May 14th. Beck Center will begin using the storefront located at 2406 Professor Avenue to offer a series of adult arts education classes in visual arts and improvisational theater. 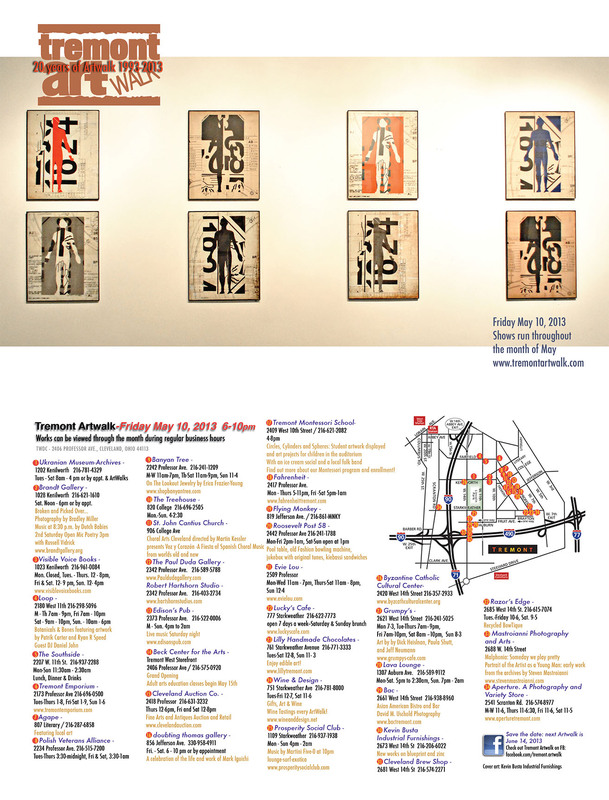 A grand opening reception will be held from 6 to 10 pm on Friday, May 10, for the Tremont ArtWalk. Music by Dutch Babies at 8:30 p.m.
2409 West 10th Street / 216-621-20824 – 8 p.m. Circles, Cylinders and Spheres. Student artwork displayed. The auditorium and we will have art projects for children to complete. Ice cream social and a local folk band playing. Find out more about our Montessori program and enrollment! !